Orange vests near the front at Foots Cray and Ted is 2nd overall in U17 men’s league. It was good to see in the last two races of the day orange vests in the leading packs. 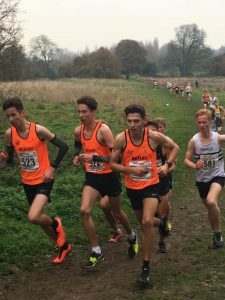 This was in the U17/U20 men and in the Senior Men’s races and Ted Higgins has finished 2nd in the U17 men’s league table overall taking into account points from all four Kent League races. 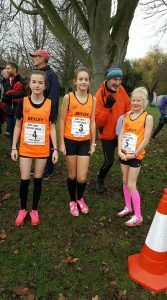 We were a bit low in numbers in some of the younger age groups today; they have had a lot of races in the last few weeks. In the U13 girls, there was no Chi Chi Rae Garland today, she is talented in other sports as well and had a netball match which clashed with the cross country. Also no Olivia Hale she hasn’t been very well this week. This left Laurel and Maya Broughton and Heather Beet; they finished 31, 33 and 39th. In the U13 boys; Luke Harry had another good run and finished 23rd next came Kahya Gediz and Rishab Singhai 47th and 49th then Ryan Puszyk in 59th. Luke Harry finished 17th in the U13 league table over the four matches. We were depleted in the U15 girls and boys and only had one runner in each. In the girls race Kacey Mae Smith looked quite strong and finished 44th. Tisha Singhai wasn’t well so couldn’t race today. In the boys race Ewan Beet who has been an ever present this season finished 51st. Jaylen Pope had another English Schools Cup match today for his school and did very well finishing 5th in that event in his age category. Again we didn’t have any U17 or U20 women but we did much better in the final two races of the day. The U17 and U20 men’s race saw Jack Higgins just finish in front of his brother Ted they were 2nd and 4th, which meant as mentioned over the 4 matches Ted has finished 2nd and he received a trophy for this. Matthew Crane and Ronnie Stowell couldn’t run today so we didn’t score in the team event. In the U20 men running in the same race Mitchell Horne was 5th and Regan Thomas 13th. No senior women today, the last race of the day was the senior men. 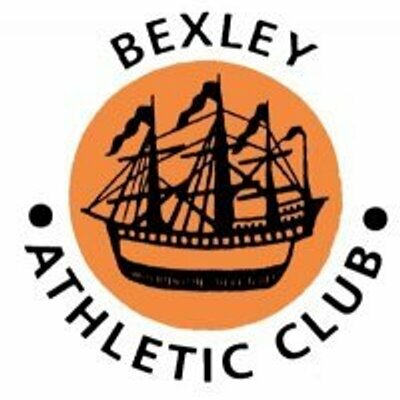 Nikki Faulkner who has been running really well recently was doing his first cross country of the season for Bexley. He recently ran a 10K on the road in 31.25 which we think is a club record. Early on in this race he was on the back of the leading group and Tom Wright was not too far behind. They ended up 9th and 11th so strong performances. Joe O’Hara was next in 37th, then Martin Jenner also doing his first cross country of the season had a good steady run in 120th, Dan Dean 144, Mark Collier155, Jon Hunter 178, Chris Gosden 196, Kevin Winch 198 and Kemal Gediz in 200th all followed. Unfortunately we only had 11 finishers so didn’t count in the 12 to score team event, but in the 4 to score we finished a very credible 5th. So no more Kent League fixtures until the final match on 16/02/19 which is just for senior women and men. Now for the championship races. Deadlines are looming for these so if you want to be entered please let Kevin or Richard know or fill in the form on the club counter. Kent Champs at Brands Hatch on 5th Jan, South of England champs at Parliament Hill on Jan 26th and National Cross Country in Leeds on 23rd Feb.